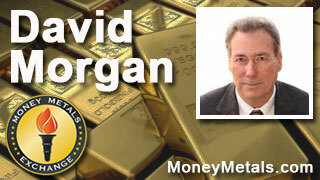 Mike Gleason of Money Metals Exchange in the U.S. interviews David Morgan of the The Morgan Report to get his take on the advance in the metals so far this year, how long it’s likely to continue, and whether or not the Silver Guru is concerned. The interview was conducted ahead of this week’s FOMC meeting and gold’s pullback before it and pick-up after. Mike Gleason: I’m happy to welcome back our good friend David Morgan of TheMorganReport.com and author of the book The Silver Manifesto. David it’s a pleasure to talk to you as always, how are you? David Morgan: I’m doing well, thank you for having me on your show. Mike Gleason: Well to start out I’ll ask you to comment on the market action here in 2016 so far. Now, gold and silver have done quite well, we had gold advancing on weakness and concerns in the equities markets earlier in the year. Now over the last week we’ve seen it continue to do well even as stocks rebounded after a strong employment report. One would think it’s a bullish sign when we get good price action even with supposedly negative news for precious metals coming out. So give us your thoughts on the market action so far this year, David, and specifically why do you think the metals have done so well here in the early part of 2016? David Morgan: Well a couple things, one to quote The Economist magazine, which is a pretty well-known and revered publication. They stated that, “This is the best start of gold mark in 35 years.” On top of that, the main reason is because the overall equity market has basically gone 20% down. From a technical perspective, you have a top in the stock market in the United States and other markets around the globe. So the most negatively correlated asset to equities is gold itself, not gold stocks. That’s basically it. I think it’s pretty simple. I don’t think you need to look much further than that. I would add on another real key element to knowing that things are finally off the bottom and going to continue, backing and filling, up and down – but nonetheless, the bottom is in – is the volume. The volume is substantial. The amount of flows into the gold ETF is the greatest that it has been since 2009, which is after the 2008 crisis but the first one that was off the bottom were the precious metals. Most of us know that gold basically bottomed in 2008 along with silver. Silver went from basically the $9 level and over several months made it all the way to $48. Gold bottomed, and I forget the number, but it went up to $1,900. Are we going to repeat that? I think in the long-term yes, but in the short-term, gold’s ahead of silver. Mike Gleason: That leads me right into my next question. We do have gold outperforming silver so far this year, which generally we don’t see when the metals as a whole are rising. That means that the gold to silver ratio has actually even gotten a bit higher, sitting at about 82 to 1 as we’re talking here [It’s since come back to around 78 – Ed.]. Are you concerned that silver is lagging gold a little bit? David Morgan: I am concerned. I believe that we have a non-confirmation. I like to see that the whites the yellow or vice versa and that non-confirmation does concern me. I think that we want to see silver over $16 and then things will proceed upward, probably even more than they have so far. In other words, silver will either play catch up or it won’t. If it doesn’t, it doesn’t mean gold won’t continue (going up). What it does mean is that there might be some more work to be done. As far as how these markets come off of bottoms, usually what happens is the big money, the smart money moves into like the large gold stocks, and they have. We’ve seen very big volume into the large top tier mining companies, and they have moved substantially higher on a percentage basis. You’ve seen that across the board, you haven’t seen those smaller stocks come up as strongly. Silver of course is a subset of gold. It’s 85% correlated with gold. And the silver stocks have performed well. So we’re really just kind of keeping our eye on silver. It doesn’t mean much other than we need to pay attention because it could indicate that again, we might see kind of a pull back, and we might come back all the way to where this launch took place. Technicians can always pick their sweet spot. I’d say about the $1,200 level. I put that out for our members that I was long gold at $1,200. Obviously that’s paying off well so far and of course I’ve put my stops up, so I’ve protected the profit. David Morgan: Great question, and of course you have to really answer it correctly, you have to answer on a case-to-case basis. But from a broad brush perspective, yes the worst is behind us for the miners. There are of course case-by-case basis that companies that won’t make it that need either a merger and acquisition type of situation that they have assets of value or they just can’t get loans at this point in time to continue their projects. And that means that there will be some even though that from, again a broad perspective things have bottomed on individual cases, that there may be some favorites out there in the lower tiers, not to mid-tier so much as the speculative tier that may not make it even though gold and silver look to continue onward. Again, I can’t give a specific answer. I will give the fact that for example that we had SVM as a short term trade for our members, the members of our website. And that stock doubled and that happened while silver basically did very little and gold was just starting it’s move. So the equities can really take off. Silver sat there from what you said, just under $14 to not quite $16, and I don’t know what the percentage is, 2 bucks on $14. 100% or a double on a silver stock, that’s a pretty liquid stock, is definitely an outperformer to what the metal itself has done. Mike Gleason: We have a mutual friend, Steve St Angelo who runs the fantastic SRSrocco Report website, he’s a bit of a peak silver guy. Where do you come down on that? We’ve seen declining production coming from places like Mexico, a huge silver producer, and other countries that produce a lot of silver, certainly here in the States. Looks like our supply is dwindling, mine production is dwindling. Where do you come down on that? What are thoughts on the potential for peak silver? David Morgan: Well, first of all, Steve and I are pretty close and we do talk I guess every month or so. I don’t agree with him totally. Again, it’s an economics situation, so if you look at it from today’s perspective, when you’re looking at sub $16 silver, that statement could look very very accurate, but if you got to $40 silver again then all the dynamics change. Because what’s very uneconomic today would become very economic at those prices. Mike Gleason: Certainly though, and I guess you hit on the point that at sub $16 silver, there is a finite supply of the metal out there, meaning the prices can stay this low forever and there still be supply, is that basically what you’re saying? David Morgan: That’s basically it. If you want to be a super deep thinker, you could argue that it’s never going higher than that, and if it didn’t a lot more mines would be out of business. I don’t take that view. It doesn’t necessarily mean that the price has to go higher, but it pretty much is a strong indication that it will. David Morgan: Yeah, tough question, and I will answer it. In my views because this is opinion and I’ll give you my thinking. Obviously the negative interest rate scenario is one that I don’t think the central banks have really thought through very well. The idea, first of all if we back up and look at all those with debt problems say, “How are we going to solve this debt problem?” “Oh, borrow more money and then increase the debt load.” That was basically what took place during the financial crisis with Hank Paulson that put out this TARP situation. Then we go to QE1 and we add more debt to our debt problem and that doesn’t work so what we should do now is add even more debt to the debt problem, which was QE2, and that’s when silver took off from $26 to $48 because people anticipated inflation in the marketplace on Main Street, not just on Wall Street. It didn’t take place on Main Street, but it did take place on Wall Street, so the market backed off for that one and several other reasons. So now we’re in a situation, well if adding debt to debt doesn’t work, what we need to do, and if a zero interest rate policy, let’s just take interest rates negative and that’s certain to work. And of course my view of certain not to work. As far as coming around to the question, the U.S. has already raised interest rates on a very very modest level. I think it was done more as a trial balloon more than anything else. I’m still of the belief or the opinion that the United States will not go to negative interest rates for a while, if ever. They may get there, but I still think that the reason that these interest rates are being raised by the Federal Reserve is to provide strength to the U.S. dollar because what’s really happened as my friend Hugo Salinas Price pointed out recently in one of his articles is there’s been a massive exit out of the U.S. dollar by the Chinese, something on the order of a trillion dollars. And that didn’t move interest rates, which is almost impossible. Anytime any market creates freely and there’s a massive buyer, a massive seller, it will change the price and interest rates is the price of money. So it certainly should have changed the price and it didn’t. There’s other interviews you can find on the internet regarding the mechanics of that and why it did or didn’t happen. My view is that the U.S. Fed, although they’ll never say this publicly, is concerned that they have to keep the dollar game going as long as they possibly can. So to make it the strongest kid on the block by keeping interest rates positive or perhaps even raising them again somewhere down the road, perhaps once again before the end of this year will give the illusion that the dollar has strength and the illusion that our economy might be doing better than other places on the globe. Which is really a fallacy, but nonetheless, perception is everything in today’s Orwellian society. So I have a different view, Mike, I think they’re going to stay the same or even perhaps increase again. I’m a very very lone wolf on this. I don’t know many people that are saying what I just said, but that’s my view. Mike Gleason: Switching gears here a little bit, we’ve seen a big drop in the registered stocks of gold in the COMEX and a seemingly ridiculous situation where more than 500 ounces of paper gold are backed by a single ounce of physical gold in exchange warehouses. What do you make of that? Is there any reason for alarm there? This is something that’s been talked about for a long time. Could we be at a tipping point as to the ability of the future’s markets like the COMEX to remain a trusted price-setting mechanism for physical gold and silver? David Morgan: Yeah, great question. I wish I had an absolute for everyone. First of all, there’s a considerable concern. The actuality of it taking place I think is rather low for a couple of reasons. One is if you read the contract that everybody signs, well they’re just an individual investor and trade, one contractor at a time or a mini contract. Or they’re a huge institution that trades thousands of contracts at a time or even a central bank that “hedges” in the thousands upon thousands of contracts at a time. The rules are what they are, which means that you can settle in cash. So if there were a stand-for-delivery mechanism, which exists, AND it was above and beyond what the physical amount of gold in the CME is, there would be paper settlement. And I’m sure that the mainstream press would probably spin it to where they would make it sound as positive as possible, something along the lines of, “Rogue trader stands for delivery, contracts settled by law with the price.” And they won’t say paper price. And “how dare they stand for delivery when everybody knows that a gold contract is just a paper mechanism to set the price and nothing to do with the physical demand.” Which of course is true and false. Less than 1% of all the trading ever results in standing for delivery and taking physical metal. Nonetheless, over the years it has taken place. And the amount of gold that exists on the CME is pitifully small, so certainly someone could stand for delivery or a few people or entities and really cause some havoc. But the next question is this: who would be willing to do that? And the answer is I don’t know. But most of the bigger players would be unwilling to do it because the negative press would be so great and probably the phone calls that you would never hear about in the public domain, about you know, it’s not going to happen, Bank X or hedge fund Y or money manager Z. We’re not going to let this happen. I am suspect, and I hate to sound so cynical, but I’ve been in this industry for 40 years and I’ve seen a lot of things. You look at what happened in the silver market back in late 70’s, and if you read the bookSilver Bulls, which I have several times, written by Paul Sarnoff, you get a pretty good idea of the day-to-day what took place during the Hunt brothers situation and what kind of conversations took place. On a personal level, I would love to see it. I would love to see someone stand for delivery on that pitifully small amount of gold and see what the heck happens, but is it going to? I don’t think it will Mike. It could. Again, I’d like to see it happen, but the outcome is not quite as optimistic, and I could be wrong. This purely my opinion, but I think if it were to take place, first of all, I just don’t think it could. I think there’ll be too many roadblocks, but let’s say that it did take place. If it were to occur, it’d be what I just said, I want to repeat slightly that the spin on it by the mainstream would be severe and they would try and make it look as if these gold bugs were causing problems and these speculators were putting misery in the markets and on and on. So it could have, to the general public, more of a negative outlay that it would be to us that understand the financial markets and how important honest money is than we might like to think. Mike Gleason: Very interesting take on all that. That’s pretty insightful. I think you’re probably right. I think we see it much the same way. But it’ll be interesting to see what happens there. Well as we begin to wrap up here, David, how do you envision the year playing out in the metals? Do we get follow through after the strong start this time because in 2014 and 2015 both, gold and silver did well in January and February only to fall off to close the year lower. So will 2016 be a different story? Will we see a strong performance in the metals continuing this time? And if so, why do you believe that will happen? David Morgan: A great refresher for everyone, yes I think we’ll have a good year but not a great year. I think the reason being is what I outlined. The biggest push for gold is a negative equity market. It’s certainly in the cards. If you look at the rollover, the moving averages, the chart pattern, everything that I know after years is the fact that the stock market looks as if it’s peaked here. And if that’s true, then you’re going to see more and more come into the gold market. Plus we have such a big start with the gold market, best in 35 years and volume. In other words, more and more are coming in the gold sector, which is primarily the large money which primarily invest in gold through the paper system meaning the ETFs. So I think we are on our way. I don’t think it’s going to be substantially huge. I think it’s going to be good. And I do think this year finally we’ll see higher prices at the end of the year than the beginning of the year. My forecast for The Morgan Report was you could have all of this assured back in January and hope you will get carried through in like the middle of March or maybe even April, middle of April, which I still hold to. I think there will be the pullback summer doldrums type of thing. A lot of these companies and the gold market and probably the silver market will come off wherever they peak but they will be higher than the end of the year last year and then they’ll just kind of wallow around, and then I think you will see a final finish for 2016 that’s positive like we usually see. The seasonality and the precious metals is usually that you get a pretty good lift near the end of the year, and of course that has not been the case as you pointed out for the last several years. In fact, in a few of those years, we got the lowest print of the year on the last trading day in the market. Going back to the CME question, most of these traders take pretty long holidays and they just don’t trade. They close their positions and they’re free of any obligations, and they’re off on holiday. So the trading platform is extremely thin, which means there are very few participants, which means it’s very easy to move the market either up or down. And most of these guys choose to move it down, so you can get a very low print at the end of the year for gold or silver. Then the mainstream financial pundits can say, “My, my look at gold close at a new low this year,” Of course it’s all true, but it’s easy to do because of the way the market is mechanically set up. Mike Gleason: The heavy volume that we’ve seen there in the ETFs, it will be interesting to see if that’s continues. Obviously that’s a good sign that there’s maybe more interest among the gold-buying community. David Morgan: Absolutely. I would like to suggest to everyone that we have, in fact, me, I basically did it all on my own this time although I’ve got talent fairly deep, a new report called “Riches in Resources.” And the “Riches in Resources” report is like eleven pages long and it will provide good information to you about the big picture on down, which means you’re going to learn from the beginning about what happens at the end of the age of empire and what the progression is to a state of empire and then it moves from there down into the resource sector, then into the gold and silver story, the dollar story, the debt problem, and then it moves forward into the mining sector and what we do here at The Morgan Report. It gives you opportunities to make money in this market, not only through a subscription on The Morgan Report as a website member, but also we just give you some freebies on how you can make money in that report. Just a very, very easy situations if you are inclined to purchase gold and silver. So we just finished it. It’s going to be available. It’s a double opt-in. Go to TheMorganReport.com. Go to the right hand side, get your pre-special report, Riches in Resources. All you need is a first name and your primary email address and we’ll send that to you in your inbox.